My family loves all the gadgets like most everyone else as we have iPods, an iPad, iPhones and other devices. It's almost a must nowadays to have at least one and of course, most use them to hold their music collection on them. They make it so easy as well to have multi-purposes for the devices such as traveling, at home, exercising and more. They are great to have but the sound is not all that great which I've learned as I take my iPhone with me on the treadmill. I'm constantly pulling out the headphones which disrupts my run as I want to use it for the Nike run app. Not having a good sound demotivates me because I get energized with music which is where Aperion® Audio Speakers comes into play as I just love my ALLAIRE™ WIRELESS SPEAKERS AND ACCESSORIES! Music has never been better! It's really a great system and my girls like it so they can't hear my voice fluttering as I sing and run per my middle daughter. 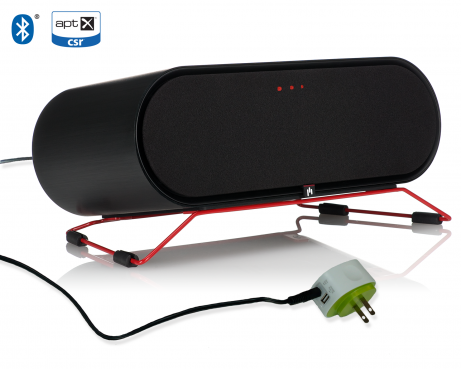 Overall, I love the Aperion® Audio Speaker system. I love the portability and lightweight feature of the speaker. The wireless adapter allows the speaker to be placed anywhere while plugging in the device somewhere else. The three music functions allows the user to adjust the sound to their preference and the various volume levels is ideal for any listener since it can be tuned in very low or very high. There was no distortion or interference heard and the sounds was incredible. It's a great speaker system to have in any house that enjoys music or even audio books and more. I would recommend it. *Disclaimer: I received the complimentary system as part of this review. The opinions are of my own.